B1602. Henry C. Lahee. Famous Singers of Today and Yesterday. Boston, L.C. Page, 1906, (Tenth Impression). 337pp. Photos & brief bios and commentary about singers, incl.Patti, Nilsson, Calvé, Scalchi, Lind, Jean & Édouard de Reszké, Melba, Eames, Alvary, Nordica & Plançon. 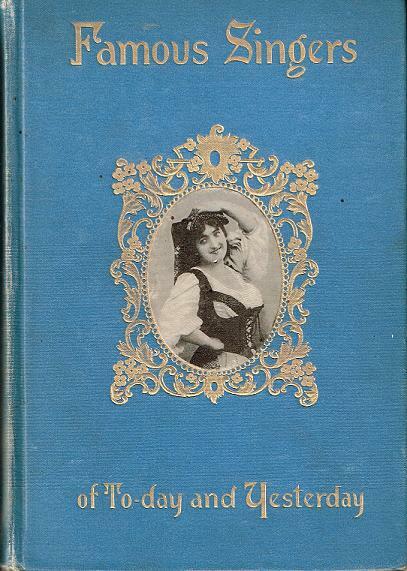 Regular printing features Calvé on cover & pages have gilt tops. Fine, ex-lib copy has faded spine. 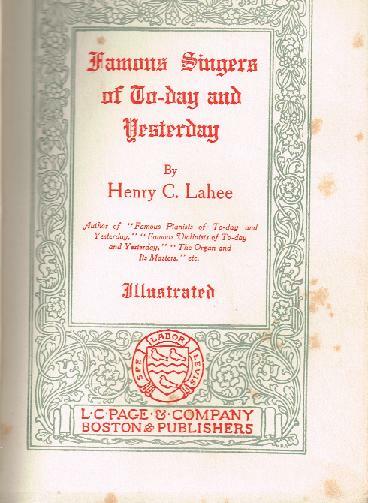 Henry Charles Lahee (1856–1953) was an American author on music. He wrote several comprehensive biographical reference works on musicians.